Leach – part of the global Chargeurs Group – provided the stunning backdrop for a 600-strong event at the world-renowned glass pyramid venue. The project saw four double-sided, free-standing Lightwalls make the 470-mile journey from Huddersfield to Paris, for an immersive evening which aimed to draw young people into the world of art. French actor Fabrice Luchini – ambassador of The Société des Amis du Louvre – unveiled the visual spectacle last week, in partnership with Chargeurs’ Philanthropies Foundation. Throughout the evening he read excerpts of text from notable French writers, including Charles Baudelaire and Marcel Proust. Leach’s illuminated displays were used to highlight classical masterpieces by Jean-Dominique Ingres, with the exhibit showcasing masterpieces from Rembrandt, Eugène Delacroix and Matthias Grünewald, to name a few. Working with Leach’s team of visual experts, the Société carefully handpicked the paintings that would feature on the vibrant Lightwalls, for maximum visual effect. Manufactured at Leach’s 30,000sqft site in West Yorkshire, the displays were also designed to direct the flow of traffic during the busy evening. Once they arrived at the Louvre, the Lightwalls took two days to install by Leach’s in-house team. The first day was used to “pre-build” the exhibit and establish the best locations and layout for optimum viewing. When the visitor experience had been perfected, the displays were then stored and reconfigured on the day of the event. Leach’s managing director James Lavin said: “We have worked on some brilliant international arts and heritage briefs throughout our 127 years in business, but for our displays to be installed within a Louvre exhibit has to be up there as one of our favourites. 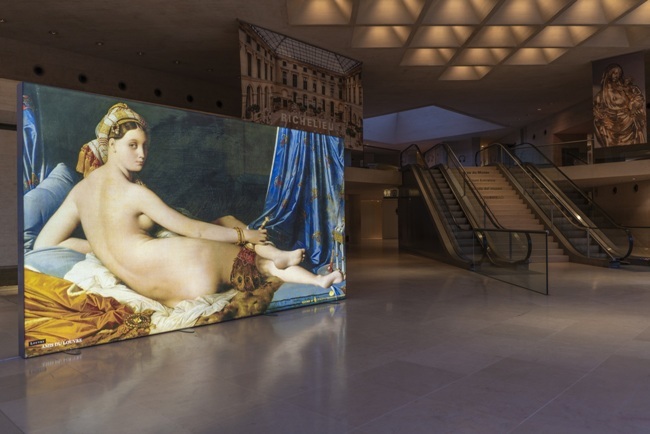 “Not only is this Parisian venue globally-acclaimed – the Société also sought the cutting-edge of display innovation for the classic works on show, so we were delighted that our Lightwalls were selected for the job.